The Sax Dakota SDAS 1020 Straight Alto Sax is the rebirth of the original Saxophone invented by the father of Saxophones – Adolph Sax. The Sax Dakota Straight Alto Sax is the finest modern version of the original that Adolph invented over 100 years ago. Dakota Sax has taken a historic design and used modern technology to create one the best Straight Alto Saxes ever. This model features stainless steel rods that guarantee fast and secure key pad closure and double key arms which enhance the smooth action of all keys and tables. Precise custom pads are hand fitted into every key cup to guarantee outstanding resonance, intonation and timbre to make the SDAS 1020 a must for any intermediate, studio or professional player. Sleek double key arms coupled with solid stainless steel rods guarantee unbelievable action and instant pad closure. This package includes a solid wood double handle travel case with russet brown leather type trim, a tweed covering and brass hardware featuring a lush burgundy velour instrument blanket. The SDAS 1024 Straight Alto Sax by Sax Dakota combines the beauty of historical instrument with modern materials and production techniques to create an exquisite instrument. This is nothing that compares to this exquisite Alto Sax. The very best in its class, it is an heirloom. Sax Dakota has created the SDAS 1024 to bring a historic instrument into the modern age. It is hand crafted to the finest detail:- the onyx color, the engraving, the pearlescent highlights on the keys, the weight and the build exudes quality. Assembled in the USA. Chris Kelsey performs exclusively with Dakota Sax models Straight Alto and Soprano Saxophones. Skinny Williams endorses and plays SDT-1200 Silver Plated Tenor Sax and SDAS-1020 Straight Alto Sax exclusively. 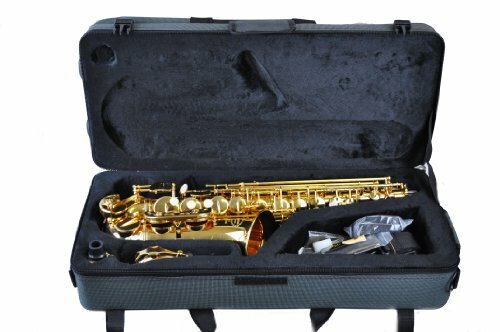 Assembled in the USA, the sax comes with a five year warranty.